Written by guest author Elise K. Burton, a doctoral student in the History and Middle Eastern Studies Program at Harvard University who earned her PhD in 2017. A new, exciting book on Iranian Jewry is making lower-tier headlines in Israel, the UK, France and even Turkey. Awareness of the work’s central figure, Abdol-Hossein Sardari, is traceable within English-language media since at least 2004 when he was recognized in a memorial by the Simon Wiesenthal Center, and he inspired a fictionalized TV drama in Iran in 2007. However, the recently debuted “In the Lion’s Shadow: The Iranian Schindler and His Homeland in the Second World War”, written by political scientist Fariborz Mokhtari, appears to be the first book-length work on Sardari published in English. So what is the story of Abdol-Hossein Sardari? Author Mokhtari paints him as a principled socialite who enjoyed the finer things in life and threw lavish parties for the Nazi officials as neutral Iran’s consul in occupied Paris– making friends in the right places for calling in favors later. Many of these favors were requested by Sardari on behalf of Jewish friends: not only for the Iranian citizens who were his legitimate responsibility, but also for their non-Iranian spouses, friends and coworkers, who were often surreptitiously granted Iranian passports from Sardari’s stash of blank documents at the embassy. But how did Iranian Jews escape Nazi harassment in France without fleeing back to their own country? Sardari sought to use the Nazis’ own racialist ideology against them, wholeheartedly embracing the Aryan-race identity for Iranians to staunchly argue that Iranian Jews were not “Jews by blood,” but rather Aryan Iranians who followed the “Mosaique religion” (ie, the religion of Moses). Thus, he maintained, Iranian Jews were not members of the “European Jewish” race and should not be subject to Nazi Jewish policies. Similar arguments were made regarding the Jews of Afghanistan and the Caucasus– these were not racially Jewish, but Aryans who had over the course of history converted to a Judaism-like religion while retaining otherwise Aryan social, cultural and linguistic traits. For example, Sardari insisted, Iranian Jews celebrated Iranian holidays like Norouz, spoke only Persian and no Hebrew (probably a slight exaggeration), had Persian names, and were in most ways indistinguishable from other Iranians. Yet Sardari’s repeated assertions to the contrary provoked a tedious cycling of Nazi official requests for anthropological information and academic investigation meant that many Jews with Iranian passports were able to dodge the Nazi policies long enough to leave occupied France or even for the duration of the war. Adding to Sardari’s heroism is the fact that he continued these activities after 1941, when the Allied invasion of Iran and Iran’s loss of neutral status meant that Sardari’s diplomatic immunity evaporated. Although he was recalled by Iran from France, at the pleading of his friends he refused to leave and remained in Paris at risk to his own safety and freedom. Yet perhaps predictably, his deeds were not well-rewarded after the war. Sardari is not currently listed in Yad Vashem’s “Righteous Among the Nations” and was only recently added as an entry to the US Holocaust Memorial Museum’s “Holocaust Encyclopedia,” but within the past decade he has become a well-known figure in his home country. His story inspired a 2007 Iranian television serial, “Madar-e Sefr Darajeh” (“Zero Degree Turn”). Directed by the popular Hassan Fathi, featuring lavish period costumes and filmed on location in France and Hungary, the show became a huge hit among Iranians, Jewish and non-Jewish. While the storyline is fictionalized, it’s not completely implausible: an Iranian-Palestinian (Muslim) student falls in love with a French Jew and, through Sardari’s forged passports, he rescues her and her family from the Holocaust. While capitalizing on the historical setting, director Fathi also manages to add in some moralizing scenes to differentiate between Zionist and non-Zionist Jews and emphasize the destructive ideology of the former. This is likely appreciated by the many Jews still living in Iran, who themselves often strive to belabor the same distinction. The show’s popularity is especially poignant given that it debuted less than a year after the infamous “Holocaust denial conference,” proving that Iranian conceptions of Jews and the Holocaust are far from uniform. Unfortunately, however, the temporal proximity seems to have left “Zero Degree Turn” far overshadowed by the “denial conference” in global media coverage. Iranian actor Shahab Hossein as Habib Parsa in a screenshot from Zero Degree Turn. Now, back to the “In the Lion’s Shadow”. Mokhtari’s book itself suffers from several flaws, some unfortunate and others predictable. The storytelling, while it strives to do justice to its compelling subject, is stilted, disorganized, and badly in need of a sympathetic copy editor. The DC-based author is not a historian, and in this popular-audience work, his attempts at vivid scene reconstruction and imparting of undocumented emotions and statements to historical actors can read like unscholarly pandering for a future screenplay. Further, the author is unabashedly pro-Shah– perhaps not surprising, since his current employer is the US National Defense University. 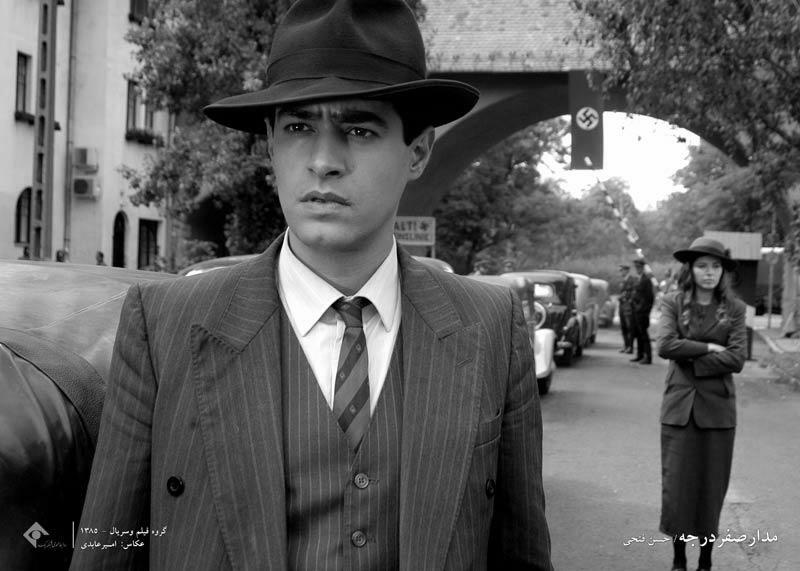 While his sympathies are placed in the historical context of the 1940s, with a detailed narrative of the Allied degradation of Iranian sovereignty (resulting in the Russian-British occupation of Iran and the forced abdication of Reza Pahlavi in 1941), Mokhtari’s political motivations for retelling Sardari’s story are more presentist. Throughout the book, he strives to paint an essentialist picture of the Iranian people as extraordinarily tolerant, with frequent references to Cyrus the Great, Sa’adi’s poetry, and so on, arguing further that the present Iranian regime is a recent aberration that does not represent the true Iranian character. While the responsible historian recoils from such cliched reductionism, it is difficult to fault Mokhtari from trying to reach out to mainstream Western audiences with a message that emphasizes the long history of Iranian Jewry, one in which contemporary Iranian-Israeli government relations are not and should not be the defining issue. Finally, a seemingly non-sequitur and undoubtedly last-minute addition to the epilogue regarding the Arab Spring should have been scrapped, and I would recommend that readers simply skip these last 2 pages. Despite these weaknesses, Sardari’s story is a fascinating one, and Mokhtari deserves resounding praise for his archival research and extensive interviewing. The book features abundant family photographs and more than adequate endnotes to make it valuable for future researchers not only on Sardari himself, but also on Iranian diplomatic history and the Iranian Jewish Diaspora generally. The book’s major Jewish protagonists, the Morady and Senehi families, and the entrepreneur community they represent, deserve a published history in their own right. The enterprising men of these families opened stores specializing in carpets and Iranian goods not only in Tehran and Paris, where they found themselves during WWII, but also in Caracas, Venezuela, where many family members eventually settled (while others ultimately journeyed to Israel and, yes, Tehrangeles). All in all, we have to thank Fariborz Mokhtari for putting together what could well be the definitive English-language work on the wartime life of Abdol-Hossein Sardari and a critical advancement of popularizing scholarship on the Iranian Jewish experience of the European Holocaust.